Those who know me know I rarely drive a car. For better and/or for worse, however, since I took my job as Executive Director at Earth Charter Indiana, I drive more than I have in years, because, well, I have further to go. For example, I recently drove to a school in Oaklandon, just east of Indianapolis. It takes nearly 30 minutes by car, which means it would have been quite the bicycle trip — especially given the paucity of bike paths that direction. Carpooling was out of the question, and I daresay a bus journey would have been a labyrinthine adventure. So I drove my metal beast. It was, admittedly, a new area of the city for me, and I was paying more attention to my directions and the street signs than to a school zone speed sign. I was nabbed by a cop. Issued a traffic ticket — my first ticket in a quarter century. On the way back home, I was mindful of the speed limit, you can be sure. No matter how many cars went zooming past me, with impunity. And it got me thinking. About kids. And cops. And danger and penalty. While we can easily see the danger posed to kids from speeding cars, it’s not always so easy to see the danger we’re creating with our pollution — pollution from corporate farming, vehicles, industrial processes and coal-fired plants. When it comes to regulation of toxins emitted from industry, there is simply not enough. There are thousands of chemicals in the environment and in our food supply, but only a minimal percentage is tested. We need look no further than the recent contamination of the Elk River in West Virginia, where 300,000 people were not allowed to drink or bath in their water. Giant farms emit massive amounts of pollution, from fertilizer run-off to methane from belching, farting beasts. And coal plants not only produce tons of toxins like mercury, they emit fossil fuel pollution that is disrupting the climate. Industry doesn’t want to regulate itself and politicians generally don’t have the courage to try. There is an effort to regulate coal plant emissions from existing and future coal plants, but it may be too little too late for our kids to grow up and enjoy the planet like previous generations did. It seems we are hell-bent to compromise the lives of our children with our unchecked pollution. Their futures are threatened; on this trajectory, with water and food systems compromised and population growing, our kids and grandkids will be spending all their time battling the weather and sweating their survival. Simply put, we are not living within the ecological footprint of what the planet can provide. Where is the cop with that radar gun? The one that says slow down, driver, let’s consider the safety of children. Grab your radar guns, people. Let today be the day you are start watching and calibrating and telling the captains of industry and the politicians that abet them to slow down the spoiling of this planet. Our kids are depending on us. Heh. 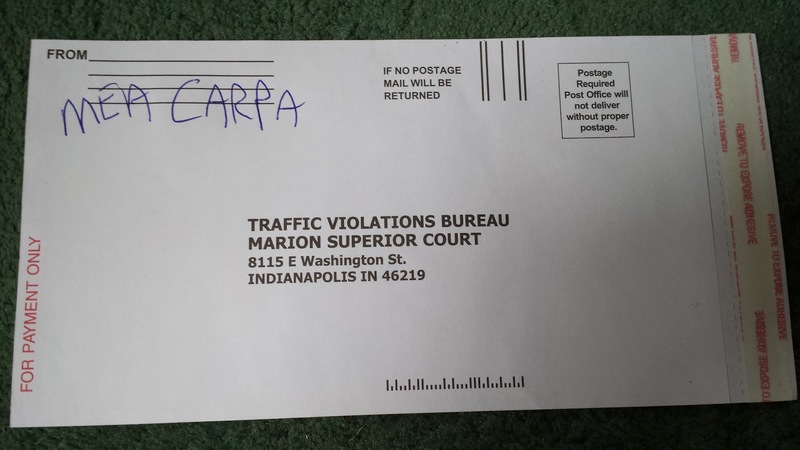 You wrote "my carp"
But what's the chances that the Traffic Violations Bureau knows latin?